Tattoo Cover up in a rush? Use these quick tips for the best looking tattoo cover up! Apply in a well lit (natural sunlight) area. Use multiple thin layers of Tattoo Undercover – this application took 3 layers. Allow Tattoo Undercover to dry completely between layers. 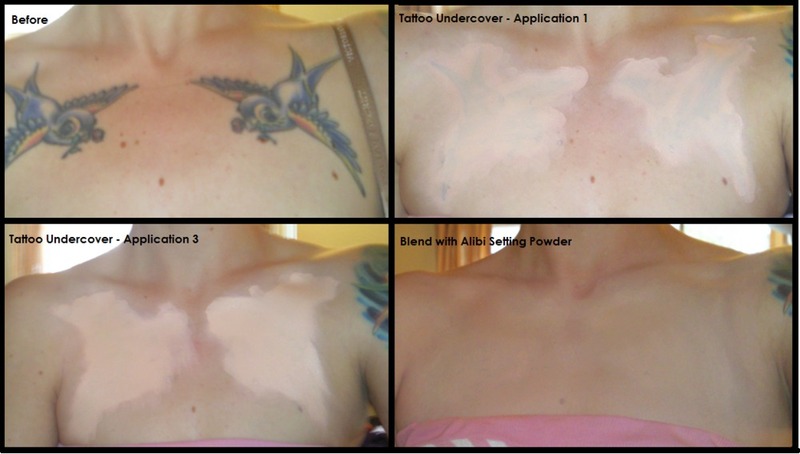 Once Tattoo Undercover has dried and tattoos are completely covered, blend edges with a dry sponge. Apply Alibi Setting Powder to set Tattoo Undercover and give a natural finish, apply multiple layers if necessary – this application took 2 layers. If you still have questions contact us directly or join the conversation on Facebook! I have a large red winestain tattoo on my arm. Will this product work to cover up my birthmark or is it only formulated to cover up tattoos? I mean to say birthmark..
where do i buy this product at?